When I first arrived in Adelaide and we moved into our new home, Em and Hugh kept reminiscing about when they lived in the richer part of town, and "hard rubbish" day would come around. Apparently, "hard rubbish" is big stuff, like furniture or paint cans or sports equipment that you don't want anymore, but can't throw in your normal bin. When I was a kid, Pops would borrow a truck and take items like these to The Dump, which was always a thrilling adventure for us. But around here, they save them up until hard rubbish day comes along, then they put everything out on the curb. In rich neighborhoods, apparently, you can find some really nice stuff. Hard Rubbish season arrived in our neighborhood in November. It started slowly at first, with a few items in front of a few houses, but within a week, our sidewalks were littered with huge piles of junk. It was awesome!! It is considered totally socially acceptable to rummage through someone's hard rubbish. There was one pile down the street I was hoping to scavenge from, but a woman with an SUV (called a "ute" around here) pulled up seconds before I got there and started chucking all the good stuff in the back of her car. Still, I found some killer stuff. For my first find, I was a little nervous at nicking people's garbage, so I made Hugh come with me under cover of night. It was a little, white nighstand made of solid wood with nicely turned-out legs. Hugh was skeptical that there could be anything decent, but he agreed that this piece was actually quite good. Outside the Croyden Bowling Club, I found an awesome lawn bowls bag (the mustard yellow suitcase-looking thing). 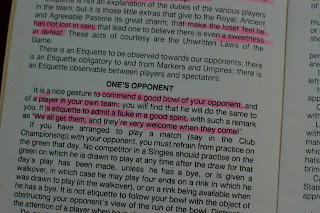 Inside, there was a film canister full of chalk and these rulebooks. 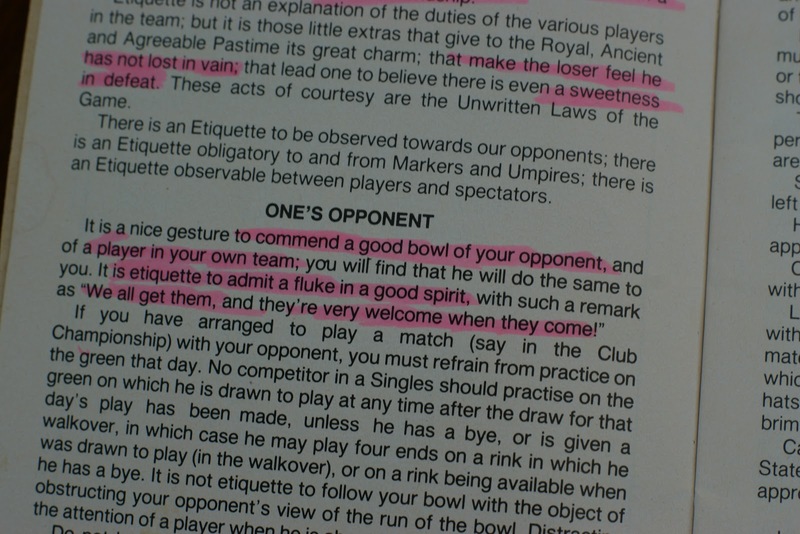 I loved that Ms. Kath Wood highlighted the bits about bowling etiquette. Dude, I think that's TOTALLY the Gigi pattern! Yeah, you think? I never noticed how Australian Gigi was. Those are all animals that are totally unique to Australia: koalas, echydnas, platypuses. Second, now I have to go home and dig out gheghe (at least that's the way I've been spelling it). I don't think it's from that, but it's definitely something. I think it's the pattern on soemthing I made for that little doll crib we used to have. I still have all the bedding from it, although the doll crib is long gone.